Mrs Gandhi says she is not "attached to any particular position"
India's Congress Party has chosen Sonia Gandhi as its new leader in parliament, effectively securing her position as the next prime minister. The party won a shock victory in the general election and is returning to power after eight years in opposition. Congress leaders have been holding talks with possible partners to form a coalition government. But Mrs Gandhi is yet to confirm she wants to be the fourth member of the Nehru-Gandhi dynasty to hold the post. "There being no other proposal, I declare Sonia Gandhi unanimously elected as leader of the Congress Parliamentary Party," said senior Congress leader Manmohan Singh, as newly elected Congress MPs banged their tables. "Truly this is a historic moment. A long spell of cold winter of nearly nine years is over and now we are in bright sunshine," he said, referring to the party's period in opposition. Mrs Gandhi was mobbed by MPs and showered with flowers when she arrived at the parliamentary building minutes after the vote. "We are all aware that we have an enormous task ahead of us," she said. 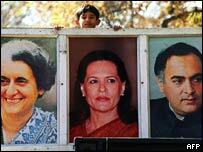 The BBC's Crispin Thorold in Delhi says it now seems almost inevitable that the Christian Italian-born widow of assassinated former Prime Minister Rajiv Gandhi will become the next Indian prime minister. It may, however, be several days before she is confirmed in the post. Mrs Gandhi will meet leftist political allies over the weekend to discuss bringing them into a coalition and deciding who should head the government. The Communist Party of India (CPI), a Congress ally, said on Saturday that it backed Mrs Gandhi to become prime minister, the Press Trust of India quoted CPI leader A B Bardhan as saying. Mrs Gandhi is expected to seek approval from President APJ Abdul Kalam early next week to form a new government. Congress, which led India to independence and then ran the country for most of the next 40 years, won the most seats in the 545-member parliament, but fell short of a majority. In her first post-election interview on Friday, Mrs Gandhi said she was not "attached to any particular position". "As far as the issue of prime minister, it will be the victorious members of parliament... who will elect the leader." Mrs Gandhi also said she was pleased that her Italian heritage - which could make her the first foreign-born Indian prime minister - had not harmed Congress in the polls. Negotiations with possible coalition partners on Friday are said to have produced the basis for an agreement - but stock markets fell on concerns of a possible role for communists in the new coalition cabinet. The fall reflected business concerns that the new coalition could be detrimental to India's privatisation programme. Harkishan Singh Surjeet of the Communist Party of India - Marxist, another key Congress ally, said the selling off of profit-making state-owned companies must stop. But Mrs Gandhi sought to reassure investors, saying that India's economic reforms had been initiated by her husband and other Congress leaders and "naturally" would continue. "For Nehru-Gandhi's family this election offered proof of its new dynastic appeal"
Would Sonia Gandhi make a good prime minister?